Skin infections are becoming more and more common in the context of the fact that human body’s ability to combat various infections has been decreasing lately. It is caused by excessive usage of various antibiotic creams and antibacterial soaps by many of us. Our skin produces special proteins to fight bacteria, but applying antibacterial creams and soaps in great amounts disturbs bacterial balance on the skin and lowers the chances of the body to combat infections on its own. That is why today’s specialists recommend to more and more people using natural antibiotics for skin infections. Their powers and properties are known for centuries, and in many cases natural antibiotics are more effective in treating and preventing possible skin problems than pharmaceutical antibiotics. Nowadays, there are many natural remedies and solutions offered by the world’s leading companies and manufacturers which can assist everyone in combating skin infections, fungus, viruses and bacteria. However, instead of running to the pharmacy, you can use various common natural products which can be found in every kitchen. Garlic. 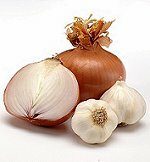 It is possible to use one of the most potent natural antibiotics, garlic, to treat various skin infections. You can apply garlic juice directly to the affected area. Onion. Another very powerful natural antibiotic, onion, can also be applied directly to the infected area to treat various bacterial infections. It is possible to use shredded onion or onion juice. Aloe Vera. Aloe Vera juice in a known natural antibiotic for skin infections as this herbal remedy has excellent antibacterial and antiseptic properties. Honey. This natural antibiotic can be effectively used against skin infections caused by insect bites or cuts. Tea tree essential oil. This natural antibiotic is very rich in antibacterial agents and can effectively disinfect skin. Use tea tree oil to treat acne, yeast and fungal infections, etc. Grapefruit seed extract. It is another very effective disinfectant and a great natural antibiotic for skin infections. Other known natural antibiotics which can be used for skin infections and many other types of infections include echinacea, thyme, ginger root, golednseal root, calendula, yarrow and so on. For all sorts of skin infections it is recommended to use decoctions and tinctures prepared from the mentioned herbal remedies. Natural antibiotics are highly effective, and their important advantage is the ability to stimulate the immune system to protect the skin against new infections.